PEP Filters is an Amiad USA company with over 40 years of experience in the design and manufacturing of automatic self-cleaning filters. 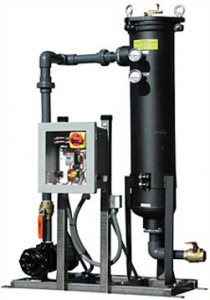 By implementing green and clean-water technologies, PEP Filters provides cost-effective and advanced filtration solutions for industrial, municipal, and commercial applications. PEP is a world leader of process water filtration, cooling tower filtration, and membrane pre-filtration, as well as seal protection and filtration of inlet water and marine life habitats, recreational water parks, and decorative fountains. PEP, Arkal, Filtomat, and Amiad brands work together to offer the best solution for your need. Whatever application you have that requires automatic removal of particulate for aqueous flow source, know that PEP Filters has a product for you. The broad product mix offers engineered solutions to a wide range of applications. Whether for 10 GPM or 100,000 GPM, PEP Filters has engineered automatic backwash media, disc, bag, cartridge and screen filters solutions as well as centrifugal separators and sweeper jets like no other company in the market. PEP Media Filters operate using a proprietary media sieved and polished to provide consistent, accurate particulate removal from a flow source. PEP Disc Filters operate using a specially designed technology. Thin, color-coded polypropylene discs are diagonally grooved on both sides to a specific micron size. A series of these discs is stacked and compressed on a specially designed spine. When stacked, the groove on top runs opposite to the groove below, creating a filtration element with a statistically significant series of valleys and traps for solids. PEP Cartridge Filters provide unmatched filtration for a wide range of fluids, whether it is drinking water or process water. Cartridges are available to treat the spectrum of filtration requirements up to 240°F temperature and 150 psi system pressures. Cartridges are available to remove taste, odor, dissolved organics and chlorine, and Pep’s special absorbent cartridges can remove oil and other viscous petroleum products as well. 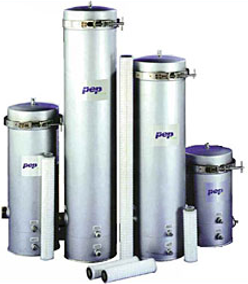 PEP Bag Filters remove suspended particulate from water and other process liquids. Contaminants such as pipe scale, grit, wax, metal chips, rust, and airborne debris exist in a broad range of particle sizes, and PEP offers a variety of bags to capture particles ranging from 0.35 to 800 microns. The Centrifugal Separator is the newest addition to PEP’s diverse product line. 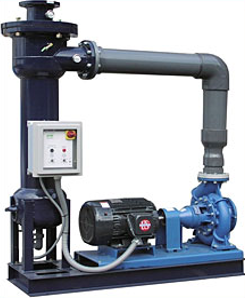 The InterSeptor® Series Centrifugal Separator (“ICS2”) is a simple mechanical device that uses the principle of centrifugal force and friction to cause the separation of suspended solids from liquids. It is a device with no moving parts, has no media and operates effectively for years without any required maintenance. 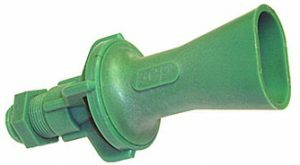 PEP Sweeper Jet nozzles have a uniquely designed elliptical discharge outlet that directs basin water toward the filter inlet in a flat fan pattern. In order for a cooling tower filter to do an effective job removing solids and contaminants from the cooling tower basin, solids must be directed toward the filter inlet. PEP designs sweeper jet systems tailored to the given application. Basin size and shape, liquid depth, competing flow characteristics, solids loading and other site-specific criteria are examined for optimal flow and cleaning results. From there, PEP determines the correct sweeper jet size, quantity and placement. To learn more about PEP Filters, click here.